Vauxhall has confirmed the prices, engines and specifications for the new Corsa, which has been unveiled at the Paris Motor Show. The fourth-generation Vauxhall Corsa will be based on a revised version of the current Corsa platform, but feature a number of revisions to the suspension and chassis. There will also be a new range of engines, along with a thoroughly updated cabin. Prices for the new hatch start at £8995 - that's nearly £3000 less the the previous model. The car goes on sale on Wednesday, 8 October, with the first deliveries expected in January. The new Corsa is available to 'just' nine trim levels (previously ten): Life, Sting, Sting R, Design, SRi, Excite, SE, SRi VX Line and Limited edition. So drivers ordering the entry-level SRi VX Line 1.2i with air-con will save £2970 compared to the outgoing SRi 1.4. And those opting for the SRi 1.2i with air-con will save £2435 over the outgoing SXi 1.2i with air-con. The engine range includes Vauxhall’s three-cylinder Ecotec engine, with either 90PS or 115PS. Both of the turbocharged 1.0-litre Ecotec engines will pull strongly, with 170Nm of torque from just 1800rpm. Start/stop technology will be fitted as standard too and the 90PS version will return a claimed 54.7mpg. It will cost £10,995 in Sting R trim. Two naturally-aspirated petrols are on offer, a 1.2 and 1.4-litre with 70PS and 90PS. As well as the six petrol engines, Vauxhall is also offering two diesels, in the form of the 1.3 CDTi with 75PS and 95PS. Both diesels come with start/stop technology as standard. Vauxhall tell us the 95PS will be the most frugal unit, combined with a braking energy recuperation system to return a claimed 87.8mpg and 85g/km of CO2. 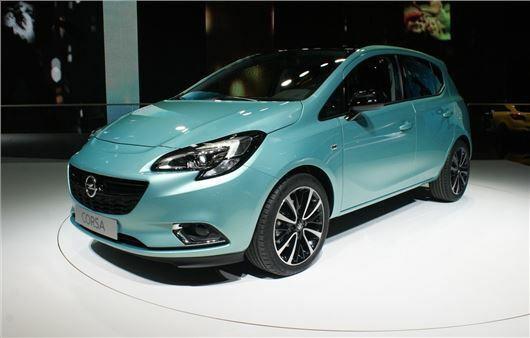 The Corsa is available in three and five-door models and the cabin will include a new dashboard layout, with updated instruments and touchscreen infotainment system. Safety kit will include high beam assist, lane departure warning and a reversing camera and Vauxhall is also promising improved levels of luxury and comfort, so expect the options list to include panoramic glass roof and heated seats. Agree totally, don't see what the 'Boy Racers' see in such a woeful engine - apart from the VXR, the bog standard Corsa's do 0-60 in January!